To understand how rhizome pruning works, it is necessary to understand the bamboo growth cycle. With each season, a specific aspect of growth happens with bamboo. Much has been made of the fact that bamboo can grow many feet in a few weeks, however, this is neglecting a major portion of the bamboo story. Shooting season, generally in the spring, is the culmination of an entire year worth of growth to the bamboo grove. Although you might identify each bamboo cane, and look at it like a tree, each cane actually is connected to the entire plant via an underground network of stems, called rhizomes. Rhizomes not only connect the entire grove together, but produce the bulk of the roots for the bamboo grove, generate the shoots that grow to become canes, and store the energy for the bamboos growth. The overall mass of the underground portion of the bamboo grove is said to be roughly equal to what you see above ground. Now you can see that each individual cane is only a small part of the story! Rhizome Pruning Consists of severing the underground portion of the bamboo that the culms grow from. To prevent the bamboo from spreading out of bounds, determine what area you want it to be growing in. bamboo grows in two ways- spring and summer the plant shoots and grows canes, which then branch and leaf out as the summer progresses. Summer and fall the bamboo puts energy into underground growth, called rhizomes. using a shovel, plunge the shovel around the perimeter of the area you want the bamboo to grow in. This will sever any rhizomes that have grown out of bounds. these young rhizomes are tender and easy to break, and usually don't have the energy to grow new canes. if you do see a new cane growing, use the shovel to cut through it. the portion of the rhizome that was cut will simply decompose. this method is called rhizome pruning, and should be done once a month from mid summer through fall, depending on temperatures. Usually by the end of October the plants are pretty much dormant, and you don’t have to worry about it for several more months. Controlling bamboo by installing a rhizome barrier involves digging a ditch around the area where the bamboo is to be contained. Rhizome barrier can be purchased commercially, and is a heavy gage flexible plastic, that is installed in the ditch, with a slight incline toward the top of the ditch. Allow the rhizome barrier to protrude above ground level by 2 inches to prevent unnoticed rhizomes. Due to the enclosed nature, make sure the entire area contained within the barrier does not fill with rhizomes. To ensure this, you may have to dig out sections of the area in alternating years. 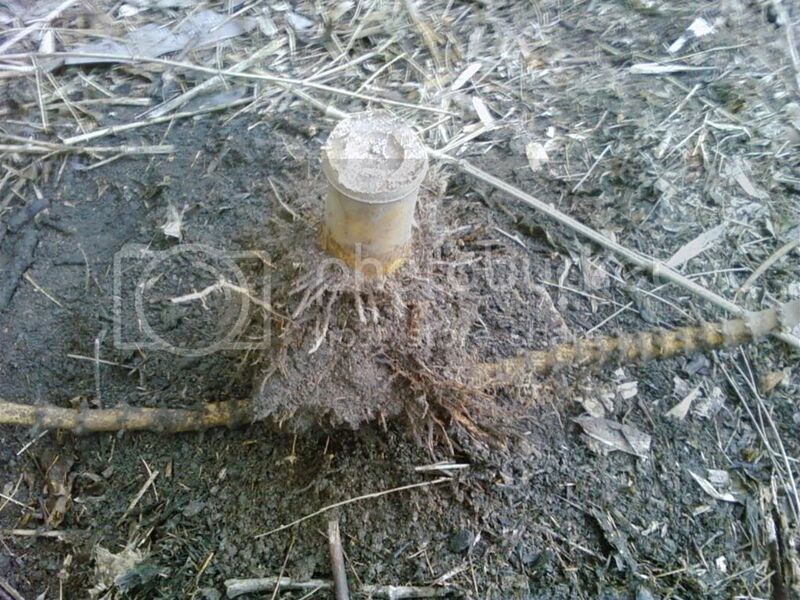 Never run electrical, Water, or other Utilities through an area enclosed by rhizome barrier and planted with bamboo. The ditch method for bamboo control simply means digging a trench around the area you wish the bamboo to colonize, then either maintain the ditch, or back fill the ditch with a soft,easy to dig material. several times per year, when the rhizome growth is active, dig into the trench to discover the growing rhizomes, and sever them with a shovel or pruners. If a wide area around the bamboo grove is possible, you can use a lawnmower to keep the new shoots from forming, or kick them over individually. this limits the growth of the rhizome somewhat, and can keep the bamboo from spreading too far. This method is NOT recommended for areas close to a property boundary.